See Miller (1955, pp. 17–18) and Miller (1952) . In this section solutions of equation (12.2.3) are considered. This equation is important when a and z (=x) are real, and we shall assume this to be the case. In other cases the general theory of (12.2.2) is available. W⁡(a,x) and W⁡(a,-x) form a numerically satisfactory pair of solutions when -∞<x<∞. See Miller (1955, p. 81) . These graphs were produced at NIST. For the modulus functions F~⁡(a,x) and G~⁡(a,x) see §12.14(x). See Miller (1955, p. 26) . the branch of ph being zero when a=0 and defined by continuity elsewhere. See Miller (1955, p. 80) . Other expansions, involving cos⁡(14⁢x2) and sin⁡(14⁢x2), can be obtained from (12.4.3) to (12.4.6) by replacing a by -i⁢a and z by x⁢eπ⁢i/4; see Miller (1955, p. 80) , and also (12.14.15) and (12.14.16). These follow from the contour integrals of §12.5(ii), which are valid for general complex values of the argument z and parameter a. See Miller (1955, p. 26) . See Miller (1955, pp. 43, 89) . For the notation see §13.2(i). See Miller (1955, p. 82) . follows from (12.2.3), and has solutions W⁡(12⁢μ2,±μ⁢t⁢2). 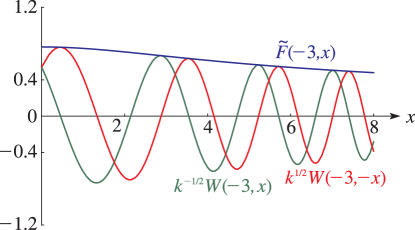 For real μ and t oscillations occur outside the t-interval [-1,1]. 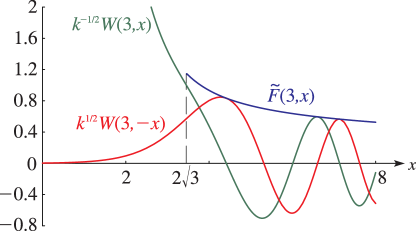 Airy-type uniform asymptotic expansions can be used to include either one of the turning points ±1. 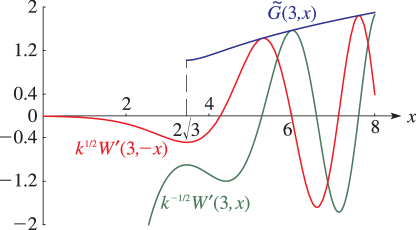 In the following expansions, obtained from Olver (1959) , μ is large and positive, and δ is again an arbitrary small positive constant. uniformly for t∈[-1+δ,1-δ], with η given by (12.10.23) and 𝒜~s⁡(t) given by (12.10.24). The expansions for the derivatives corresponding to (12.14.25), (12.14.26), and (12.14.31) may be obtained by formal term-by-term differentiation with respect to t; compare the analogous results in §§12.10(ii)–12.10(v). uniformly for t∈[-1+δ,∞), with ζ, ϕ⁡(ζ), As⁡(ζ), and Bs⁡(ζ) as in §12.10(vii). For the corresponding expansions for the derivatives see Olver (1959) . 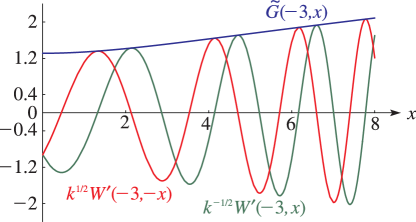 In this case there are no real turning points, and the solutions of (12.2.3), with z replaced by x, oscillate on the entire real x-axis. and ξ¯ and the coefficients u¯s⁡(t) and v¯s⁡(t) as in §12.10(v). See Miller (1955, p. 87) . where k is defined in (12.14.5), and F~⁡(a,x) (>0), θ~⁡(a,x), G~⁡(a,x) (>0), and ψ~⁡(a,x) are real. F~ or G~ is the modulus and θ~ or ψ~ is the corresponding phase. Compare §12.2(vi). For properties of the modulus and phase functions, including differential equations and asymptotic expansions for large x, see Miller (1955, pp. 87–88) . For graphs of the modulus functions see §12.14(iii). For asymptotic expansions of the zeros of W⁡(a,x) and W′⁡(a,x), see Olver (1959) .